November 29, 2009 - updated the "analyzing the names" page. November 29, 2009 - added a copy of a post regarding Rutz's originating from Pomerania. 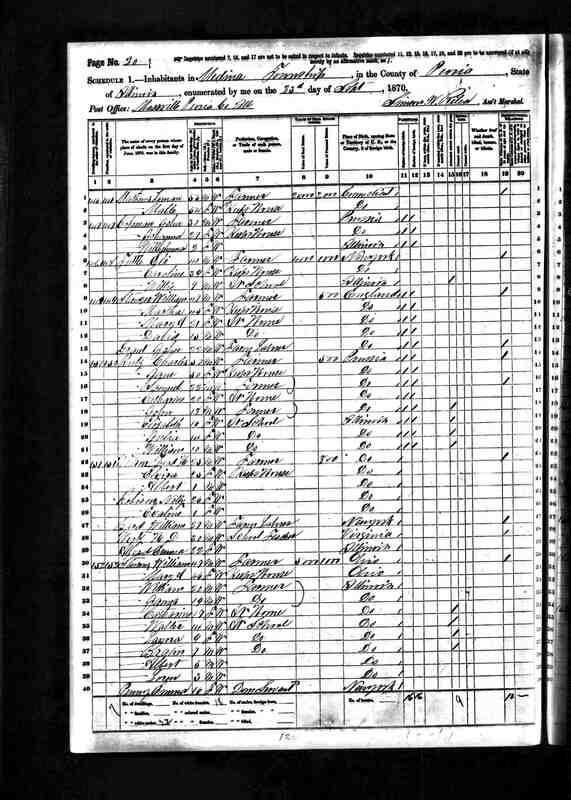 November 29, 2009 - added notes about how the 1890 US census was destroyed by fire. August 10, 2009 - replaced the page about the 1848 German Revolution with a page on German Immigration. July 09, 2009 - more ramblings on the names-analysis page. Carl Ruthz is the name that was written on the passenger list of the Aeolus in 1854. After he immigrated to the United States, he used the name Charles Franklin Rutz. Born: December 7, 1820, in German Bohemia (per the 1910 US census). Caroline Ruthz's maiden name is unknown. born: 1827 (per Aeolus passenger list) in Germany? died: December 3, 1854 (after they had arrived at New Orleans on November 14, 1854). married: to Carl Ruthz around 1846-1847 (assuming Wilhelm was born about a year after they were married). died: December 17, 1854 (2 weeks after its mother Caroline had died). I saw your name among my husband's (Kurt Denke) DNA matches and your surname stood out. Kurt's 2nd great grandmother was Carolina Rutz (or Ruetz, or Ruhtz), born in 1832 in Pomerania. We don't have a birth record for her, but her children were born in Sassin (now Sasino, Poland) near the Baltic coast. The parish was called Ossecken. She later immigrated to Wisconsin. Do you happen to know where your Rutz ancestors originated? If it won't display for you, I can send you an 'invitation' by email. Arrived in New Orleans on November 14, 1854. Carl Ruthz lists Charbrow as their origin before they emigrated. I assume Charbrow is Charbrow, Pomerania . The birth certificate of Augusta's 8th child (Carl Friedrick Kielmann) lists Pomeron as Augusta's place of birth. I don't know how long the Carl Rutz family lived there. With over-population and the numerous crop failures taking place in central Europe at the time, there was a lot of moving around. But, because Augusta was 4 years old, they must have lived there at least that long. Note the following 2 newspaper articles refering to an individual as Carl Ruthz in a German newspaper and as Charles Ruthz in an English newspaper. The name of Carl Ruthz is rare. The individual in the newspaper articles is about the same age as Owen Rutz's great-great-grandfather. The French military police have accompanied Carl Ruthz, upholsterer from Darmstadt, Germany, from the prisons of Colmar, France to the German frontier. Carl Ruthz had worked from 1834 through 1839 (until the moment of his capture) for an employer in Strasbourg, France. He was industrious and of good character, and his absence caused a touching scene between his comrades and his employer. At a short distance from the city, the prisoner was greeted by about 15 friends who were waiting for him in a hostel. They served him a toast, and when they parted painfully, Carl Ruthz thanked them for the friendly guidance. They sang a farewell song composed by one of the singers. What is Carl Ruthz's difficulty which motivated this melancholy affair, after which he spent three months in our city (Darmstadt, Germany)? We know the following: Carl Ruthz was in Frankfurt in 1833 at the time of the "1833 Frankfort Student Revolution". He took a lively interest in it, and he, like several young people wound up in the matter, fled to France, where he remained until the year 1839. He thought he would be able to return to Darmstadt, Germany, but after some time he was forced to give up again to evade investigation by the police and returned to Colmar, France, where he worked until a legal problem involving his former Darmstadt, Germany employer occurred. The French government did not want to extradite Carl Ruthz on the basis of political issues. So, the German government of Heffen-Darmstadt, Germany requested extradition of Carl Ruthz by fabricating a charge of forgery. Carl Ruthz had ordered products from a manufacturer in the name of his Darmstadt, Germany employer. The required goods were, this is certain, paid for by the defendants; it is also true that Carl Ruthz's employer allowed Carl Ruthz to use his name, so that the employer would get the goods as quickly as possible. The French newspaper thinks that the mistake of having used another person's name remains and must be legaly resolved. But Carl Ruthz had permission of the owner of the Darmstadt, Germany firm to use his employer's name. The German government's forgery charge was a ploy to have Carl Ruthz extradited from France to Germany. So what offense is Carl Ruthz guilty of? The Frankfurter Wachensturm (German: charge of the Frankfurt guard house) on 3 April 1833 was a failed attempt to start a revolution in Germany. About 50 students attacked the soldiers and policemen of the Frankfurt Police offices Hauptwache and Konstablerwache to try to gain control over the treasury of the German Confederation to start a revolution in all German states. However, because the plot had been betrayed to the police, it was easy to overcome the attackers. In June 2010, Phyllis Gross (great, great, granddaughter of Charles Rutz 12/7/1820) gave me a 3 page paper of what she remembered Lewis Rutz, Sr. (her grandfather) telling her about his family history. "One year when we were having the annual wood cuttings for Grandpa, I asked him if he would sit down and tell me about his life. And he did. He told stories about his grandpa and great grandpa and about his life and I wrote. Later I put it in story form. I have never tried to verify any of the facts. I just put down what Grandpa told me. It was a great experience for me. I hoped he enjoyed telling it. Phyllis"
In 1979 Kay Busch (a descendant of Samuel Rutz) traveled to the last farm that Carl Ruthz had lived on. It was currently owned by Lewis F Rutz, a son of William Rutz (Carl Ruthz's first son). She met with Lewis along with several other grandchildren of "Charley". The following is Kay's notes from that meeting. In July of 2009 Owen Rutz contacted a professional genealogist to assess the historical records available in Charbrow, Pomerania. In the 1860 US Census, Charles "Roots" listed his birth country as Germany. The story is that Charles wanted to disguise his identity because he skipped-out of the Prussian military. 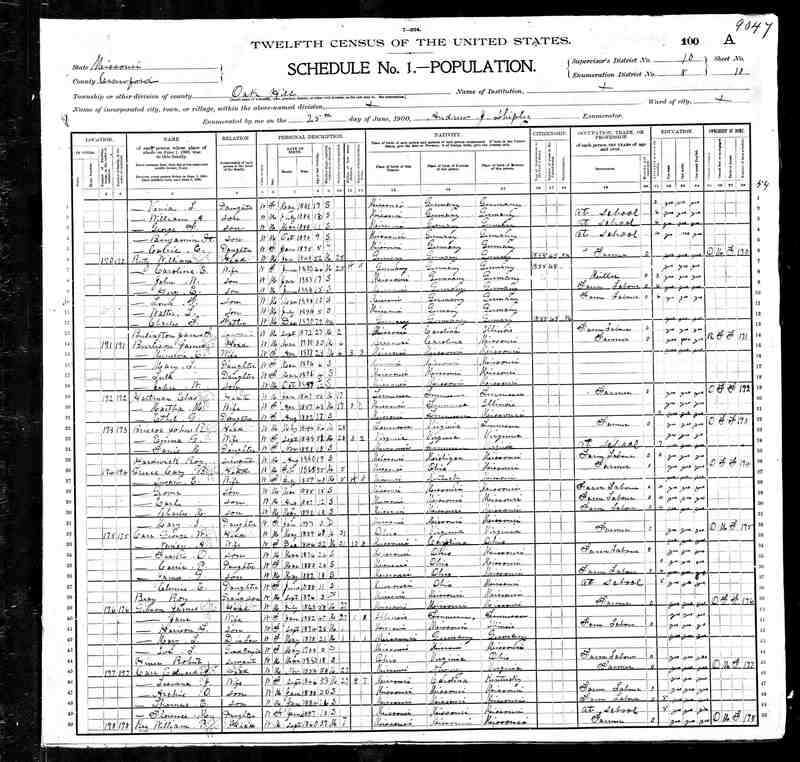 This is a page from the 1870 US Census. This is NOT Charles F. Rutz of Brush Creek. This Illinois Charles Rutz is the same age as the Missiouri Charles Rutz. It lists Charles and his family with the last name of Root. Charles is 49 yeaers old and Mary Ann is 34 (their correct ages). It lists Prussia as the "country of foreign birth" for Charles and William. 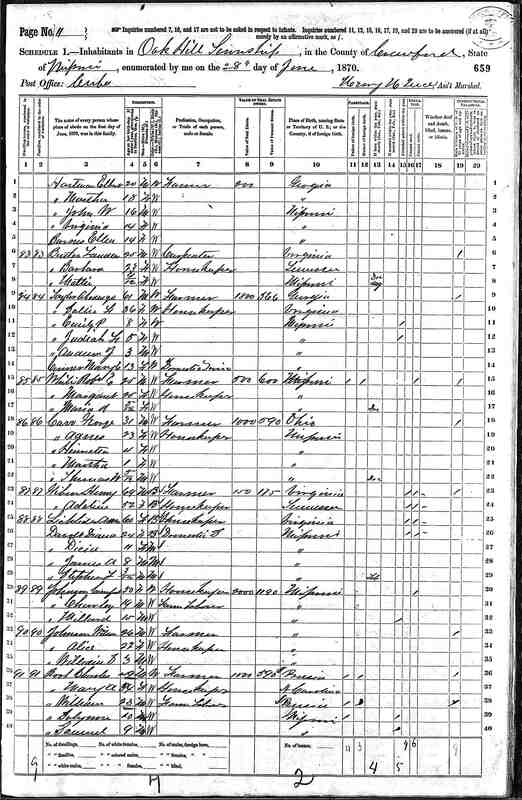 This is a page from the 1880 US Census. It lists Charles and his 7 children, but Mary Ann is not listed. The place of birth is listed as Germany. William is listed as living at a different location with Caroline, their 2 children and 2 servants. 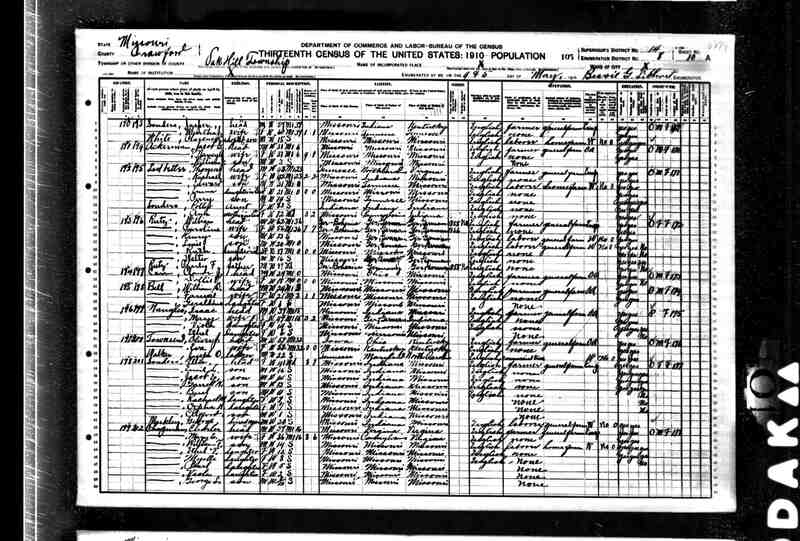 The 1890 US Census was destroyed by a fire. Almost all of the original 1890 population schedules were destroyed or badly damaged by a fire in the Commerce Department in 1921. Records enumerating only 6,160 individuals (less than one percent) of the schedules—survived. None of the 1890 records from Missouri survived. 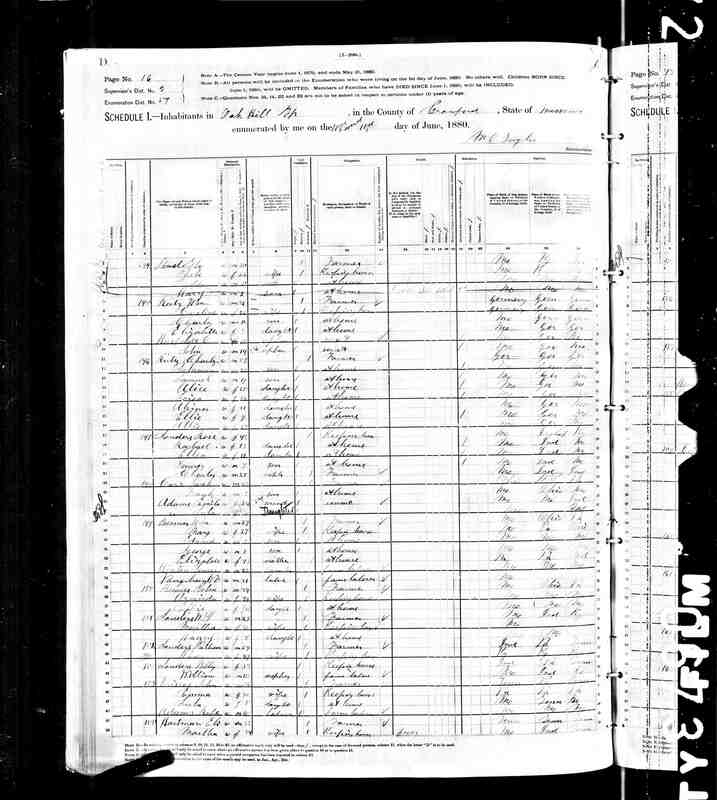 The 1900 US Census, Oak Hill township, Missouri: Charles F. Rutz. The census lists the birth place for Charles, his father and mother as Germany. He was born in 1820 and that he came to the US in 1855. It lists 1855 as the year he immigrated to the United States. What strikes me as a little bizarre is that Williams wife, Caroline E.
same year as William and his family. 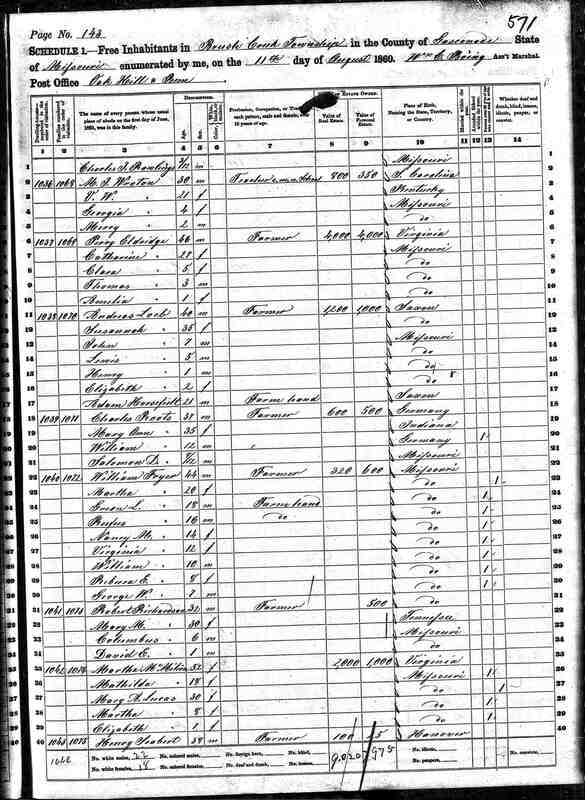 Note that this census shows Lewis and his wife Ruth living at William\Wilhelm's home. German Bohemia is the most specific location ever given for where Charles (and William) were born. was a region in Czech Republic established, for a short period of time, after the World War I. It included parts of northern and western Bohemia once largely populated by ethnic Germans. Jablonec nad Nisou (Gablonz an der Neiße), Litomerice (Leitmeritz), Most (Brüx) and, Žatec (Saaz). Organized by authority of Gen. Lyon June, 1861. General orders: Guard the Pacific Railroad bridges. In March 1861 the Missouri Constitutional Convention of 1861 voted 98 to 1 to stay in the Union but not supply weapons or men to either side if war broke out. The security of a large munitions depot became an immediate flash point. On April 20, 1861, eight days after the start of the war at Fort Sumter, a pro-Confederate mob at Liberty, Missouri, seized the Liberty Arsenal and made off with about 1,000 rifles and muskets. This set the stage for fears that Confederates would also seize the much larger St. Louis Arsenal, which had nearly 40,000 rifles and muskets—the most of any slave state. Union Captain Nathaniel Lyon hastily raised a militia, gained control of the arsenal (which was under the command of Peter V. Hagner), and started sending all but 10,000 rifles and muskets to Illinois. Lyon's militia had been recruited from German immigrants and members of the Wide Awakes political organization. The Germans in particular were unpopular with many native-born Missourians with Southern backgrounds, who deeply resented their anti-slavery views. On May 10, Lyon forced the surrender of the 669 militia under General Daniel M. Frost. The men refused to take the oath of allegiance to the Federal government. As a result, Lyon decided to march the prisoners to the arsenal through downtown St. Louis before providing them with a parole and ordering them to disperse. This lengthy march was widely viewed as a public humiliation for the state forces, and immediately angered citizens who had gathered to watch the commotion. To add to the insult, Lyon placed the captured militiamen between two lines of armed German Home Guards. Tensions quickly mounted on the streets as civilians hurled rocks, paving stones, and insults at Lyon's troops. The heavily German Home Guard units were particularly targeted by the mob and shouts of "Damn the Dutch" were hurled at them from the crowd. Exactly what provoked the shooting remains unclear, but the most common explanation is that a drunkard stumbled into the path of the marching soldiers, and fired a pistol into their ranks, fatally wounding one German soldier, Captain Blandowski. The volunteers, in retaliation, fired into the crowd, killing some 20 people, some of whom were women and children, and wounding as many as 50 more. Rumors spread throughout the city that the Germans were planning to murder the American population of the city which caused many of the wealthy citizens of St. Louis to flee to either Illinois or the Missouri Interior. Eventually the installation of martial law and the arrival of Federal Regulars to relieve the German volunteers would bring the situation to a conclusion but the impact of the Camp Jackson Affair left its mark on St. Louis permanetly. Nativism, mistrust of the Federal government, slavery, and states rights issues all played roles in provoking the incident. The Affair polarized the state between Union and Confederate supporters. Previously most Missourians had advocated neutrality. However the Camp Jackson Affair forced most Missourians to take a side. Some former Unionists, including former Governor Sterling Price, now advocated secession. But ultimately the actions of Lyon and the St. Louis German community did much to ensure Missouri's continued loyalty to the Union. And in the years following the war, the Germans would gain a reputation as "saviors of Missouri." The story is that the steamboat that Charles Rutz and his family took to get to Hermann Missouri was snagged and then sank or at least took on water. The story continues that Charles Rutz lost all of his possesions, "even his hat" and arrived in Hermann with only the clothes on his back. I have searched for a Missouri River steamboat sinking below Hermann sometime between January and May of 1885. Capt. Joseph S. Nanson was born in Fayette in 1827 and operated a store in Glasgow until he went to St. Louis in 1855 and purchased the steamboat, Banner State, which he then piloted on three trips between St. Louis and Glasgow before it hit a snag on the third trip in April of 1855 and sank. He then bought a boat called the Tropic and ran it for the remainder of the 1855 season. Glasgow is located on the Missouri River between Kansas City and Columbia. Only the Banner State incident occured below Hermann on the Missouri River. "The lower Missouri was alive with boats from 1850 to 1865. There were between two and three hundred. As many as fourteen would leave St. Louis in a single day. Pilots were scarce and they didn't average more than a single one to a boat. In traveling between here and Kansas City, you were never out of sight of a boat, and they were loaded with freight and passengers like a bush with blackberries. Indians? Well, I guess so! I knew all the great western chiefs, Sitting Bull, Rain-in-the-Face, and Red Cloud. I knew 'em before Bill Cody did, and I was in that country when he came up there and got to be a scout. Apparently the Rutz surname may have originated in southwest Germany, Landkreis Sudwestpfalz. But, it is interesting to note a concentration of Rutz surnames in northeast Germany, Landkreis Uecker-Randow. The oldest Rutz in the RootsWeb WorldConnect database is Philips Rutzs (the s suffix probably means: son of Rutz), 1530-1592, Asbach, Germany. Asbach is also in southwest Germany, about 240 km north of Sudwestpfalz. Another old Rutz in that database is Gorius Rutz, 1553 - ??? ?, Nesslau, St. Gallen, Switzerland (northern Switzerland). An interesting tree I found ended with Carl Friedrich Rutz's (b.1770) son Johann Friedrich (b.1809). Unfortanately there where no data on Johann's decendents or date of death. "Der Kries Wirsitz Ein Westpueusisches Heimatbuch"
The first Evangilical (Lutheran) church was built in Friedhiem about 1.5 km from Brostowo in 1778. The church in Brostowo was built by a gentleman from Schonlake Pomerania named Kruska in 1795.
when or where they were from. Does anyone have any information regarding this or any other solid confirming evidence? John Rutz's current contact information is unknown. “Auf dem Winkel 8“ in Bad Zwischenahn is the address of the East German Homeland Room. The indoor exhibition is designed as an informative display with exhibits that are constantly being supplemented – including pictures, maps, costumes etc. Outside there is a commemorative plaque for the expellees, set up with the help of the Bad Zwischenahn health resort administration, a memorial stone for our East German compatriots and a memorial stone donated by the Wirsitz homeland group. Every winter season since 1985, the association has organised historical and cultural public talks which are well attended. The East German Homeland Room e.V., an association devoted to preserving East German cultural heritage, was founded in April 1980 by Herbert Papstein. Initially it consisted mainly of the collection from the Wirsitz/West Prussia homeland group and was housed in the Bad Zwischenahn water tower. Gradually, in untiring effort, the collection was extended to cover all the East German provinces: East Prussia-Memelland, Pommerania, West Prussia , Silesia, Eastern Mark Brandenburg. The aim of the association is to collect, research, care for and evaluate East German cultural heritage from the regions of expulsion. By creating archives, museums and libraries and organising exhibitions, the association hopes to keep this heritage alive for expellees, refugees and the entire German people as well as foreigners.